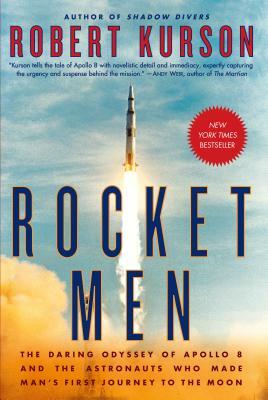 Rocket Men: The Daring Odyssey of Apollo 8 and the Astronauts Who Made Man's First Journey to the Moon (Hardcover) | The working bookstore for the reading class. Okay. Fifty years ago, 1968. Not a good year. The Vietnam war was raging. Mayor Daley and his henchmen in Chicago bludgeoned crowds at that year's Democratic Convention. Martin Luther king was assassinated, as was Bobby Kennedy. The Summer Olympic Games saw two on a medal stand with raised fists in a Black Power salute during the playing of The Stars Spangled Banner. And to boot, the Russians were aiming to send Cosmonauts to the Moon in an effort to stick their fingers into American eyes. America badly needed some good news. We clearly had the moon in our sights. But the Apollo Program wasn't ready. A year earlier, Apollo 1 with its crew was incinerated during a simulation on a launch pad. Apollo 7's crew suffered all kinds of problems with biomedical and other gear while in space. The calculations and systems needed to send a space craft to a location a quarter of a million miles away were simply not ready. But "no" was not in NASA's dictionary. All systems turned to "Go! "And this book takes readers for a ride fifty years after the event that stunned the world. The men. Frank Borman, Jim Lovell, Bill Anders. The women behind the men. The angst. The all too human "pee" and "puke" in a zero gravity environment. Years later, Neil Armstrong called Apollo 8 "an enormously bold decision", while Christopher Columbus Kraft, head of Mission Control, claimed, "It took more courage to make the decision to do Apollo 8 than anything we ever did in the space program." So, here's your chance to relive the incredible thrills of doing the impossible for the first time.